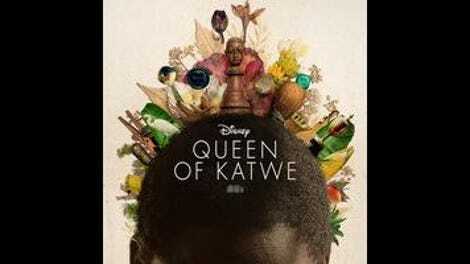 Queen Of Katwe, Disney’s new rags-to-riches biographical drama about Ugandan teenage chess prodigy Phiona Mutesi, is exotic on some levels and predictable in others. It’s set in Katwe, a massive slum area of the Ugandan capital city of Kampala that’s teeming with life, constantly moving in every direction through the sewage-dampened, trash-strewn streets in a dizzying swirl. That’s certainly something to behold, although it’s a vision of Africa that’s appeared on film before. In some ways, the more novel element is the film’s depiction of chess, which in Katwe is a popular sport on the level of football. And while that might seem unlikely, it’s accurate, at least in the wake of Mutesi’s success. Director Mira Nair has a proven ability to find beauty in the most desperate of circumstances, and Queen Of Katwe is no different. Throughout the film, she makes stunning use of the brightly colored patterns of traditional African clothing, which contrast strikingly with the muted tones of the characters’ polluted environment. (The film was shot on location in Uganda and South Africa.) Nair’s directorial touch is also evident in big crowd scenes; whether chaotic (a Kampala traffic jam) or meticulously organized (a chess tournament), they’re expertly, elegantly staged. Outside of these moments of spectacle, though, Queen Of Katwe is less of a sports movie and more of a family drama. At the beginning of the film, 10-year-old Phiona (Madina Nalwanga) lives in a tiny shack with her struggling single mother, Harriet (Lupita Nyong’o), as well as her older sister Night (Taryn Kyaze) and two younger brothers. 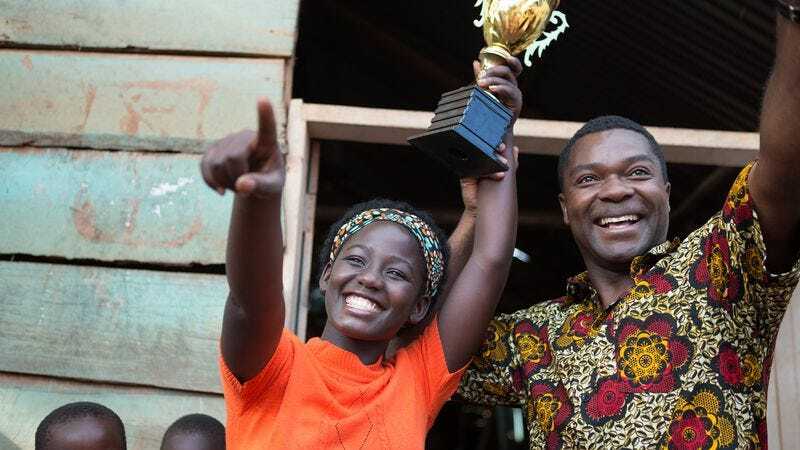 Frustrated by her mother’s insistence that she go out and sell vegetables to feed the family, Phiona and her brother wander into a sports ministry program run by engineer-turned-missionary Robert Katende (David Oyelowo). There, Phiona is introduced to chess, for which she has a natural aptitude; although she’s never been to school and can’t read, she easily beats players much older and more experienced than she is. That aptitude takes Phiona and her teammates to chess competitions in Syria and in wealthier parts of Uganda, where they see for the first time what life is like outside of Katwe. And once she’s seen what’s possible, Phiona is no longer willing to submit to the models of womanhood presented by her mother and sister, an attitude Harriet takes very personally. Oscar winner Nyong’o brings depth to what could have been a clichéd martyr character in Harriet, playing her as a proud, independent woman who’s distrustful not because that’s her nature, but because circumstances have forced her to be that way. She wants nothing more than for her children not to suffer as she has, but doesn’t know any other way to live. Oyelowo is also predictably good as Katende, a stubborn, deeply loving man who has experienced tragedy in his life, yet remains optimistic about the future. Some films would have wallowed in Harriet and Katende’s sad backstories, or in the disastrous events that lead Harriet, Phiona, and the rest of the family to homelessness and despair during the course of the film. Instead, Nair chooses to emphasize hope and determination; even when things are at their worst, the characters maintain their dignity and their faith. (The religious element of the film is similarly downplayed.) This cheerfulness extends to the chess scenes, where Nair makes excellent use of her young actors—first-timer Ethan Nazario Lubega is a standout as Benjamin, one of Katende’s chess “pioneers”—to mine comedy out of what can be a pretty boring game to watch. So what keeps Queen Of Katwe from being great, as opposed to just good? At times, the film is as slight as it is cheerful. But mostly, there’s the fact that you don’t have to have read ESPN writer Tim Crothers’ book on Phiona to know how this story turns out. Both as an underdog sports movie and as a coming-of-age family drama, Queen Of Katwe is undeniably formulaic, and the moments of triumph and defeat occur exactly when—and how—you’d expect them to. But predictability can’t squash all of the film’s appeal. And as far as empowering role models for preteen girls go, you could do a lot worse than Phiona Mutesi.